Neighborhood Symphony Bouncer is rated 4.8 out of 5 by 30. Inspire a love of music from day one. As soon as you return home from the hospital, a baby bouncer gives you a safe and secure place to rest your little one. Keep your baby comforted with soothing motion and melodies that introduce an entire world of classical music. 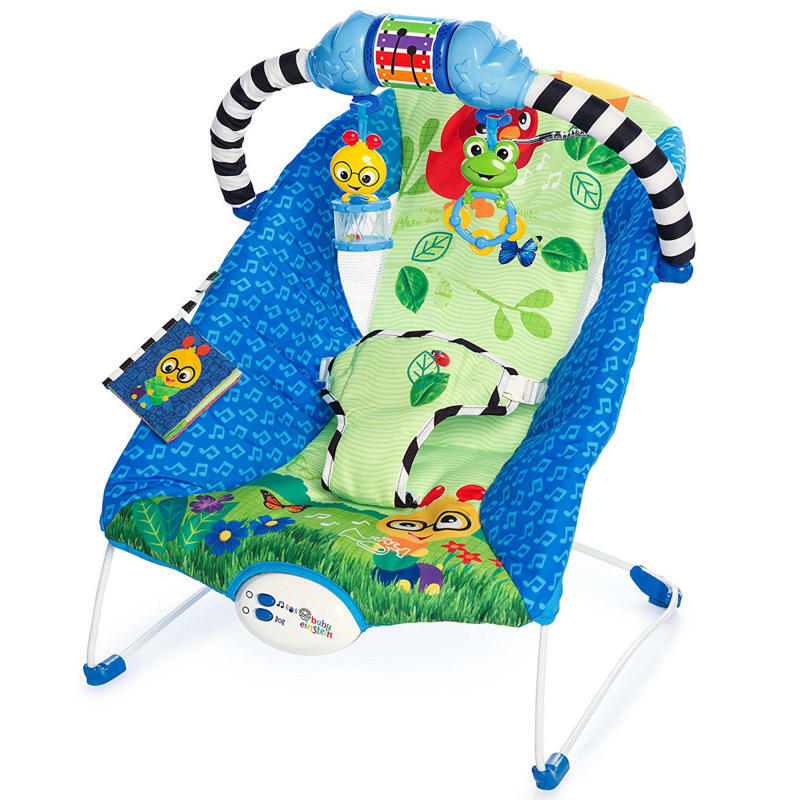 The vibration feature makes this Baby Einstein seat a calming cradle that your baby will love. As your baby grows, watch as they pull for the musical chime and flip through the fabric book. The soft bouncy seat cradles your little one with inspiring melodies that will develop a love of music to last a lifetime. Dimension (in) 27.5" x 20" x 25"
Seat pad – Remove from frame. Fasten buckles on seat restraint and seat pad. Fasten all hookand-loop patches to the corresponding patch. Machine wash with cold water, gentle cycle. No bleach. Tumble dry, using low heat.Toy bar and toys – Wipe clean with a damp cloth and mild soap. Air dry. Do not immerse in water.Frame – Wipe the metal frame with soft, clean cloth and mild soap. Rated 4 out of 5 by Jacip1234 from Cute Baby Einstein Bouncer Colors are bright, vibration is strong enough, and fabric is soft. I’m happy with this bouncer and my little one enjoys it. Rated 4 out of 5 by Jacip1234 from Cute Baby Einstein Bouncer Colors are bright, vibration is strong enough, and fabric is soft. I'm happy with this bouncer and my little one enjoys it. Rated 5 out of 5 by amandar1985 from Great features! Keeps baby entertained! I love the vibrations and soothing music that it plays. My baby will sleep in it for hours comfortably. Rated 5 out of 5 by Birdee from Great bouncer! This is the perfect unisex bouncer seat. My little one enjoys laying in it, and he's really enjoying the toys on the bar. It's easy to clean and stow away when not in use. The perfect gift for a new mom, or for the grandparents to keep at their house for babysitting. Rated 4 out of 5 by BloggingMama from Very entertaining & comfortable for newborns-20 lb I've been a Baby Einstein fan for a long time now so this bouncer was appealing to me from the start. I figured you can't go wrong with classical music for your little one and a super comfortable padded seat. Off the bat, the bouncer was easy to put together. The toy bar is easy to remove when needed. The fabric is very soft to the touch and my little one really seemed relaxed to be sitting in the seat. The toys are very entertaining and I found myself playing with them as well. We especially loved the fabric book that sounds like crunching leaves. The vibration feature and several relaxing sounds make this a very nice bouncer to own. When I first received the bouncy seat, I tried everything out. Beyond the toys on the toy bar being a little hard to pull at times like they were sticking in place or something, I did not have any further issues I could think of. When I tried another day, I had a few more issues to look into. I am thinking that it is a possibility that somehow the batteries became loosened. I plan to do a few more tests, but currently if you turn the vibration on or off when in the baby activated mode it just turns the music off. Also, the sound is not activated at times when hitting the toy bar or moving the seat around. All this to say, I think it is a very cute bouncy seat and would also look at purchasing their walker and rocker with this specific Neighborhood Symphony line. Rated 5 out of 5 by SMakkk from Interactive and Engaging We've been using the Baby Einstein Neighbourhood Symphony Bouncer over the past week, and have really enjoyed the interactive features. The crinkle book can be detached, and has bright, eye catching counting photos. The pull and spin chime toy is a great addition, and I love that the toy bar can also be detached (as can the two soys that are suspended from it)! This bouncer has two musical settings - you can either turn the upbeat classical tunes on, or set them to play when baby moves. The vibrate function is also great. The unit itself is light, super portable, and so easy to assemble. The cover comes off easily to be put in the wash (we have already washed and hung to dry once, and the cover still looks good as new). This bouncer is bright, fun, and a great way to engage baby when you need your hands free.